First two weeks of gsoc was terrible. University tried to ruin my life. Fortunately I won every fight so far, and the battle is almost over. It seems that nothing can stand between me and the best Track Editor... STK can ever have. Except my own stupidity of course, but that’s something everyone has to face (or at least it is what I hope). 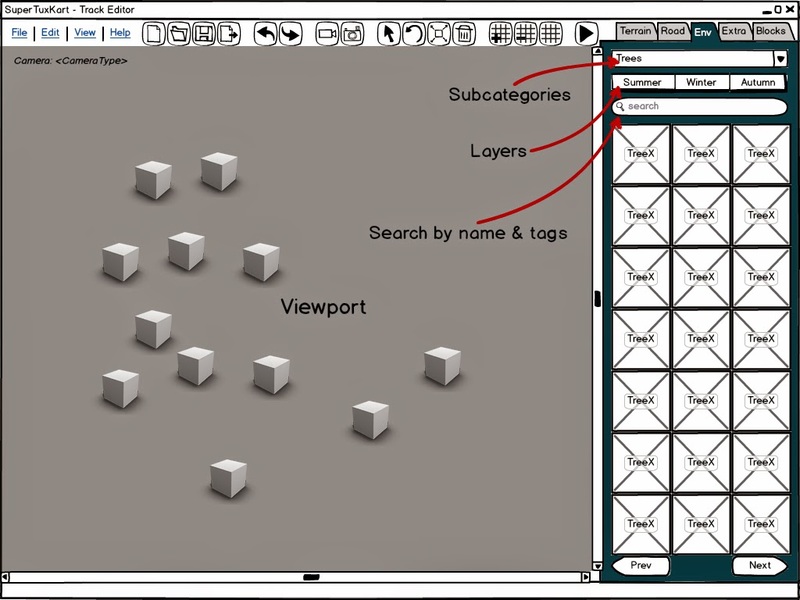 A grid based 3D editor with all features a map editor must have: pre-made elements can be placed, selected, moved, rotated (90 degrees for sure), and removed. Commands can be canceled. The element library is easily extendable, and prepared to contain a huge amount of objects. Moving and rotating multiply object together is also supported. Roads can be created using fix road parts. There are 2 kinds of camera: an isometric for editing, and a totally free, which lets you have a clearer picture of your work. There are also some ideas which maybe won’t be ready until the end of gsoc period, like a tool to make roads with splines. To make a model available in the editor, three files have to be placed into the right folder: the model itself, a preview image and an xml file containing information about the model for categorizing. There is a magic “Try your Track!” button, which tries to launch the game if it is possible (e.g there is a starting position for tracks). Nothing is final - I am not even sure if that toolbox should be there, or if we should use prev / next buttons or a scrollbar in the object list. I started to create quickly a usable prototype for the basic gui stuff (images are also just temporary). Using this, I’ll be able to work on the basic back-end stuff in the next few weeks. Then we will have a better view of how the whole stuff works, and I hope I’ll be able to create a usable user interface with your help. Please say hello if you are interested in the editor, and feel free to write any advice / idea / expectation about features and about gui as well. If you are interested, I can write other blog posts in the future about the progress. I can write about cats too, as it is written that internet loves cats. Some say cats are overrated, but they are wrong. Cats are cool. It is impossible to overrate them. Wonderful ! We can test this software >> Track Editor ?? Of course you can test it, but there isn't really anything to test yet. Ok, Where you can download this for Windows ? There are no binaries for now. Perhaps there will be once it's done, but for now you need to build it. Yes, the only way to try it at the moment is to download the source from github. When there is something to test, I'll create windows binaries and share it in upcoming blogposts.